A look at the life-changing connection between a retired and widowed American philosophy professor and a young Parisian woman. Gillian Anderson Leaves Alien Abduction Days Behind… | Stuff.co.nz. Interview: Gillian Anderson Talks Last Love – Yahoo Voices – voices.yahoo.com. People often try to find familiarity and comfort in their lives wherever and however they can during times of emotional confusion and transition. Even if their new choices confuse their family members, living their lives the way they wish is a desire many people strive for, particularly as they grow older. This is certainly the case in writer-director Sandra Nettelbeck’s new comedy-drama, ‘Last Love,’ which is based on French novelist Francoise Dorner’s La douceur assassin. Gillian Anderson portrays an American who’s estranged from her father in the film, but who will do whatever it takes to protect his emotional needs in the last years of his life. 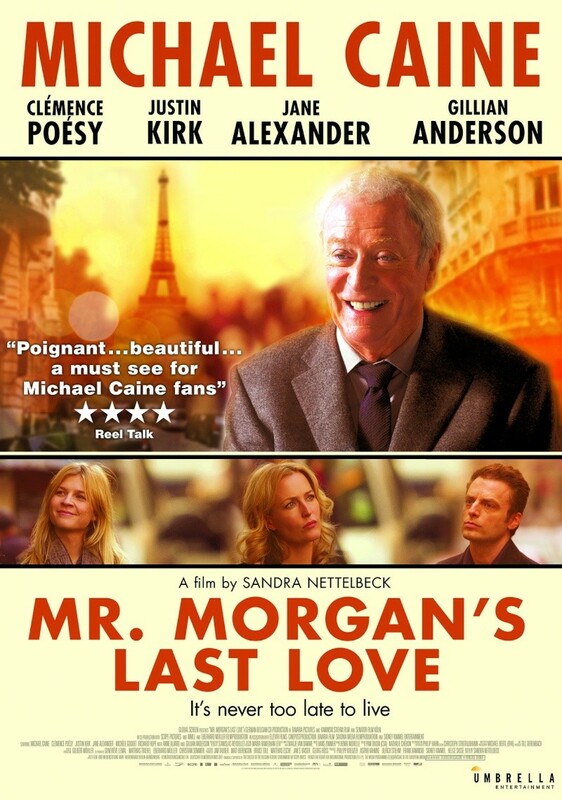 ‘Last Love’ follows American Matthew Morgan (Michael Caine) a former philosophy professor who moved to Paris with his late wife, Joan (Jane Alexander), to live out their golden years together. Three years after her death, he still grieves for his wife, particularly while he’s passing through the areas where they spent their time together. After unsuccessfully attempting suicide, due to his inability to move on from his loss, Matthew is inexplicably saved by a young dance instructor, (Clémence Poesy), whom Matthew meets on the bus and immediately reminds him of Joan. The two form a close relationship, much to the concern and confusion of his two children, Karen (Anderson) and Miles (Justin Kirk), who travel from America to France to try to convince him to come home. As the two witness their father’s developing relationship with Pauline, Karen and Miles realize that Matthew is exactly where he wants to be, living his life the way that comforts him in his final years. Anderson generously took the time recently to talk about filming ‘Last Love’ over the phone. Among other things, the actress discussed how the chance to work with Nettelbeck and Caine on the comedy-drama in part drew her to the character of Karen; how she’s worked with several filmmakers, like Nettelbeck, who have both written the script and directed the film, which she feels is beneficial, because they develop a deep connection to the screenplay; and how she has grown attached to doing smaller projects, like ‘Last Love,’ as she enjoys that they’re focused more on the characters and theirrelationships than anything else. Question (Q): You play Karen Morgan in the new comedy-drama, ‘Last Love.’ What was it about the character, and the script overall, that convinced you to take on the role? Gillian Anderson (GA): Well, the first thing is that I have been following the director’s career for some time. I’ve been a fan of Sandra’s work, starting with ‘Mostly Martha.’ We attempted to work together before. So when she called and said, “I’m sorry this is such a small role, but I’d love for you to do it,” I agreed. At the time, she was also in conversation with Michael Caine, and it looked like he was going to potentially do the film. So it was all of those elements coming together. Also, reading the script and getting to know the character, and feeling like I know how to play her, is where it began. Q: Speaking of Sandra, she both wrote the screenplay for, and directed, the comedy-drama. Do you prefer working with helmers who also penned the script, and what was your working relationship with her like on the set? GA: I’ve had that experience quite a lot, of working with directors who have also written the script. I find it fun to be a part of that journey for them, because a lot of times it also tends to be their first or second time directing. That’s happened quite a bit in my experience. So being a part of that creative genesis for a director is interesting, and I like being part of that process for them. Also, when a director is a good writer, they have a very deep connection to the script. The stuff they have written is potentially something they have labored over for a small period of time. Or it might even be based on their own experiences, which adds a completely different dimension to it. Q: Like you mentioned earlier, Michael Caine is also in ‘Last Love,’ and he plays Karen’s father, Matthew. While you don’t have much screen time with him, what was your overall experience like with him on the set? GA: Well, Michael’s such an icon. I’ve obviously been a big fan of his in the past, and I think he’s been involved in some extraordinary films. He’s also had some extraordinary life experiences himself. I’ve worked with some of the greatest people in the industry over the years, and he’s a lovely man to work with. He’s lovely to be around, and is very generous. Q: Justin Kirk, who portrays Karen’s brother, Miles, is the main actor you have scenes with in the film. What was your working relationship with Justin like on the set? GA: Well, Justin’s a lot of fun, and he’s very funny. We had a lot of fun with the brother-sister dynamic. We joked around that we should do a sequel about their relationship. He was fun to improv with. I think he’s fantastic in the film, and I hope this movie will do good by him. Q: Were you able to have any rehearsal periods with Michael and Justin before you began shooting the comedy-drama, and how much did you improve with your co-stars while you were filming? GA: No, there wasn’t any rehearsal. But Justin and I goofed around quite a bit, and did some improv that did end up in the film here and there. But I’m not in the film very much, but the bits we did together were great fun. Q: ‘Last Love’ explores the difficult emotions people contend with as they grieve the loss of a family member, and how that anguish causes estrangement with their surviving family members. Were you able to relate to Karen and Miles’ estrangement from their father after their mother’s death? GA: Well, I think all family dynamics are complicated. So I think the character is still dealing with the loss of her mother. Obviously, you have a sense that she’s in control in her life, and is used to being able to call the shots. Not being able to control her father, and contribute to the decisions that he’s making, which she feels have an impact on their lives, is very frustrating to her. Q: Karen and Miles question the new friendship their father develops with dance instructor Pauline Laubie, played by Clémence Poésy, in the film, even though they have been estranged from Matthew since their mother’s death. Even though Pauline offers Matthew comfort, why do you think Karen and Miles immediately question the nature of the relationship? GA: Well, I think in the beginning it’s just a shock. The minute Karen arrives, her brother tells her that their dad, who just attempted suicide, apparently over dealing with the grief over losing their mother, is having an affair with a 20-year-old. (laughs) So initially, I think it’s the shock of that information, which isn’t true, is justifiably quite big. At the same time, I think there’s obviously a misunderstanding over the nature of their relationship. It takes some time for Justin’s character to come to terms with what’s good in that relationship, which is benefiting his father. Q: ‘Last Love’ was filmed in several areas of Europe, most notably Paris, where the story is set. What was the experience of shooting in France, and how does it compare and contrast to filming in America? Q: The film has played at several film festivals, including the Locarno Film Festival and the Munich Film Festival. Were you able to attend any of the screenings of the film, and if so, what kind of reaction did you receive from the audiences? GA: No, unfortunately. At first, I thought I was going to be able to go to the one in Berlin, but then they changed the date by about three days, and I wasn’t able to make it. Q: What is the experience of shooting smaller movies like ‘Last Love,’ as opposed to the bigger studio movies you’ve starred in? GA: Well, I’ve actually done quite a few quiet films. Even over the last couple of years, I was in ‘Shadow Dancer,’ and a French film called ‘Sister.’ I think because of some of the stuff I’ve done for the BBC, I’m used to doing quieter pieces that are more about the characters and their relationships, more so than you might expect. I often choose those roles over the bigger studio films overall. Q: You have appeared on several television series throughout your career, most notably with ‘The X-Files;’ most recently with ‘Hannibal;’ and the upcoming ‘Crisis.’ What is it about television that you enjoy so much? How does starring on a series compare and contrast to filming a movie? GA: I’m actually involved in three different TV series right now. I’m a regular on ‘Hannibal,’ and I’m also on a BBC series called ‘The Fall,’ which we’re going to continue shooting in February. That’s available on Netflix in the States. I’m also on the NBC series, ‘Crisis,’ which we’re in the process of shooting right now.